Halloween will be here before we know it, and Yellow Moon are ready! They sent us some of their Halloween themed crafts to try at home, so we celebrated early this year. I have talked about Yellow Moon before and how much we enjoy their craft kits. I love them because everything we need in included – most of the time we literally just add glue. For our first two activities we didn’t need to add anything at all! The prices on the Yellow Moon site are great. You know you’re going to receive good quality items, pay a low price and even earn cash back for your school, group or charity. It’s a win:win situation. Halloween masks – these were so easy to do. Robot and I made all four within around 10 minutes and with guidance he managed to put his two together by himself. His pumpkin one didn’t look exactly as the image on the packaging but he was very happy with it, so that didn’t matter at all. Even the dog tried to get in on the Halloween photos! We played with the Pesty Pirates next, competing against one another to see how high we could get our pirates to fly. Obviously Robot won that particular challenge (he ‘didn’t see’ my pirate almost touch the ceiling, apparently). At £2.75 for a pack of six these are great for party bags or to give to trick or treat visitors as an alternative to sweets. 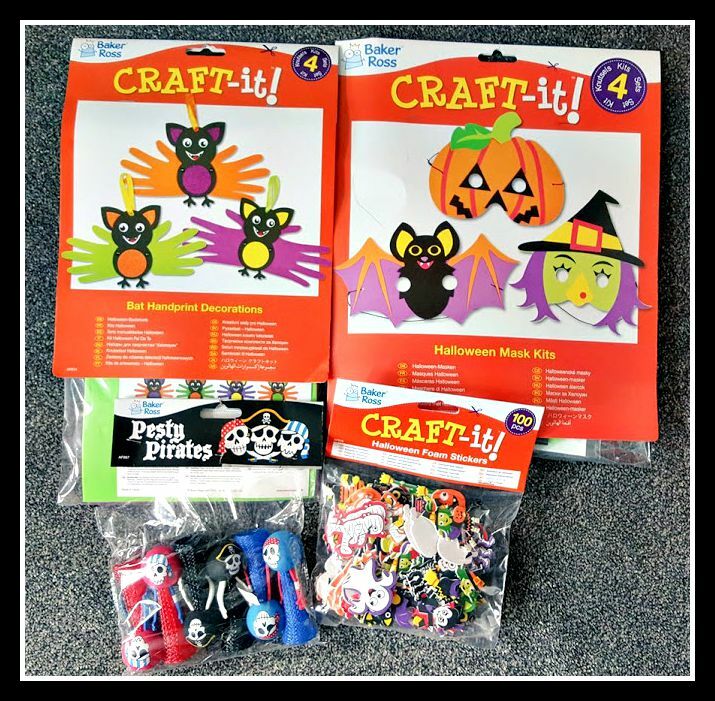 We’ve got two more activities to do yet – the Bat Handprint Decoration Kit and the Halloween Foam Stickers – so look out for our next Halloween craft instalment later in the week. I’ll be involving Badger as well next time because bats are his favourite animal in the world. 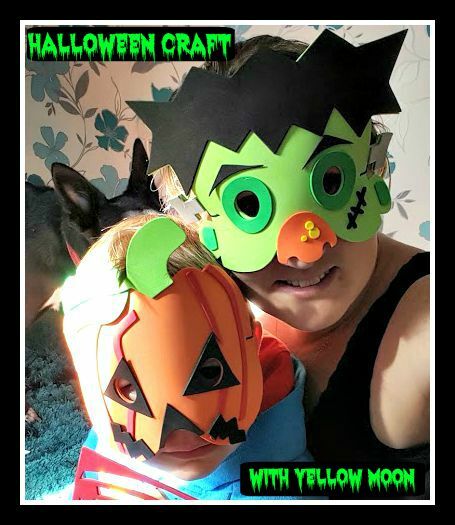 If you’re planning a craft session at Halloween, why not make an evening of it and throw a little family party? There are some great Halloween party food ideas floating around on the internet at the moment and I’m sure it’d be easy to find some ghoulish games. I’ve bought the boys a great book to read in the run up to Halloween this year – it was a steal from The Works as part of their 10 books for £10 offer (great for stocking fillers in the run up to Christmas, too! ).